Anicius Manlius Severinus Boethius (usually known simply as Boethius) (c. 480 - 525) was a 6th Century Roman Christian philosopher of the late Roman period. He is sometimes called the last of the Roman philosophers and the first of the Scholastics, and his final work, the "Consolation of Philosophy", assured his legacy in the Middle Ages and beyond. His Latin translations of some of the works of Aristotle were the only ones available in Europe until the 12th Century. Boethius (pronounced Bo-EE-tius) was born in Rome to an ancient and important patrician family which included emperors (Petronius Maximus and Olybrius) and many consuls on both sides. His father's line also included two popes. His father, Flavius Manlius Boethius, was consul in 487. His exact date of birth is disputed, although it is usually located at around A.D. 480, (the same year of birth as St. Benedict), or sometimes A.D. 475 or 476 (the same time as the last Roman emperor, Romulus Augustulus, was deposed). He was left an orphan at an early age and was educated by the pious and noble-minded Symmachus, whose daughter, Rusticana, he later married. His father is recorded as proctor of a school in Alexandria, Egypt in the period around A.D. 470, and Boethius may have received some of his formidable education in Greek either there or in Athens. Either way, as early as 507 he was known as a learned man, and he entered the service of Theodoric the Great, the King of the Ostrogoths and de facto ruler of Italy (Theodoric had replaced Odoacer who had deposed the last emperor of the Western Roman Empire in 476). In 510, he became consul in the kingdom of the Ostrogoths, and by 520, at the age of about forty, Boethius had risen to the position of magister officiorum, the head of all the government and court services. In 522, his two sons were both appointed consuls, reflecting their father's prestige. In 523, however, Theodoric had Boethius arrested on charges of treason, possibly for a suspected plot with the Byzantine Emperor Justin I, or possibly just due to the political slander of his rivals (as Boethius himself claimed). He was stripped of his titles and wealth and imprisoned at Pavia in northern Italy, and finally executed in 524. By the 8th Century, Boethius was represented as a martyr for the Christian faith (his family had been orthodox Christian for about a century, and Theodoric was an Arian heretic), and he is recognized as a saint by the Roman Catholic Church (although there some who dispute that he was a Christian at all, or that he abjured the Faith before his death). Boethius' lifelong project was a deliberate attempt to preserve ancient classical knowledge, particularly philosophy. He intended to translate all the works of Aristotle and Plato from the original Greek into Latin, and his completed translations of Aristotle's works on Logic were the only significant portions of Aristotle available in Europe until the 12th Century. However, some of his translations were mixed with his own commentary, which reflected both Aristotelian and Platonic concepts. He also produced commentaries on the "Isagoge" of Porphyry (c. A.D.233 -309), an important text on the Platonic treatment of the problem of universals, as well as several original treatises on Logic. 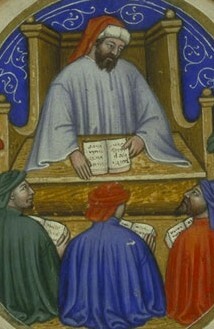 Boethius' theological works, which generally involve support for the orthodox position against Arian ideas and other contemporary religious debates, were much studied in the early Middle Ages. Boethius's most popular and enduring work, though, was the "Consolation of Philosophy", which he wrote in prison in 523 while awaiting his execution. The work is cast as a dialogue between Boethius himself (bitter and despairing over his imprisonment) and the spirit of philosophy (depicted as a woman of wisdom and compassion), and is alternately composed in prose and verse. It teaches acceptance of hardship in a spirit of philosophical detachment from misfortune, and parts of the work are reminiscent of the Socratic method of Plato's dialogues. The work takes up many problems of Metaphysics and Ethics, and it treats of the being and nature of God, of providence and fate, of the origin of the universe, and of the freedom of the will. Interestingly, it contains very little Christian influence, and its focus is much more on Neo-Platonism and even a recourse to Stoicism. Many manuscripts survive, and it was extensively edited, translated, commentaried and printed throughout Europe from the late 15th Century onwards (including translations by Chaucer and Queen Elizabeth I), and it has been one of the most influential books in European culture. In particular, the concept of the "Boethian Wheel" (or the "Wheel of Fortune"), depicting the rise and fall of man, was frequently used in the "Consolation" and remained very popular throughout the Middle Ages and beyond. Boethius also produced texts on mathematics and the theory of music. His loose translation of Nicomachus' treatise on arithmetic (and his translations of Euclid on geometry and Ptolemy on astronomy, if they were in fact completed, although they no longer survive) contributed to medieval education, and his mathematical texts were used in the early medieval universities. He also introduced the threefold classification of music: music of the spheres/world, harmony of human body/spirit and instrumental music (including the human voice).